PAMELA D. WILSON is a caregiving expert, advocate, and speaker offering support to family caregivers and professional caregivers through her business of the same name. Since 1999, Pamela has been a business owner providing direct service to families, individuals, caregivers, health and care providers, attorneys, and financial planners in the areas of care management, care navigation, caregiving services, caregiver support, elder care, legal and financial appointments and estate administration. Throughout her caregiving career, Pamela has provided education and training, advocacy, and support for family and professional caregivers. Today caregiving education, training, advocacy, speaking, and caregiver support are the main focus of her business. As the result of the aging population and increase in need for family caregivers—nearly 4 in 10 Americans are caring for a loved one—it is critical that family caregivers are knowledgeable about options, plan for care, and advocate for care needs. The increase in diagnoses of chronic disease, dementia, and Alzheimer’s disease strains the ability of family members—many who became caregivers as the result of an unexpected crises— to provide daily support, navigate the care system, and to plan for future needs. Professionals in healthcare, care agencies, care communities, and in the legal, and financial professions have a similar desire to be knowledgeable and to serve as a resource for family caregivers. Due to the specialization required in these industries and the day to day job demands, it is difficult for professionals to advise beyond the specialties in which they operate. Pamela’s expertise in the industry since 1999 provides the opportunity for professionals working in the industry to expand knowledge beyond their day to day specialties through training and education programs offered by Pamela. 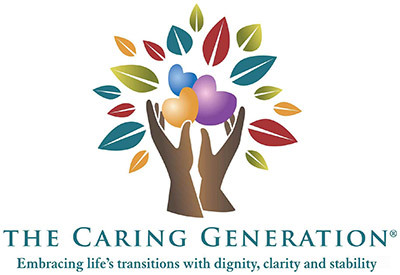 Information, education, and support is offered through The Caring Generation Library®, through Pamela’s book, The Caregiving Trap: Solutions for Life’s Unexpected Changes, articles, podcasts, webinars, online support groups, speaking and training. She produced and hosted a radio program on 630 KHOW-AM in Denver called The Caring Generation®. Pamela continues to develop programming and education on topics to support family and professional caregivers. Pamela is a member of professional associations focusing on estate planning and elder care, financial and estate planning, caregiving, aging, and healthcare. For those who know Pamela and her personal story, she remains forever “the baby”. Hint: listen to Tales of The Caring Generation, “The Baby” to learn more about Pamela. Pamela was born in Omaha, Nebraska and lived in a small neighborhood where she knew the names of each family on her block and in the neighborhood. Her grade school class at St. Francis of Assisi numbered less than twenty and consisted of many good friends with whom she remains in touch today. The neighborhood in South Omaha was bordered by the stockyards, and industry and was knitted together by a Catholic Church and School. There was little crime. In the early 1960’s it was safe to play in the streets. Families were hardworking and taught a similar work ethic to their children. Pamela’s mother was a model caregiver who cared for members of her family many times bringing them into the family home for brief periods of time. Other times her mother, Rose, faithfully visited family in nursing homes and hospitals. Flowers were traditionally placed on family graves each Memorial Day. The family proudly celebrated Mother’s and Father’s Day. Rose taught Pamela the basics of life, for example how to pass through a grocery store line, make purchases, and count change. She instilled in Pamela a love for reading through trips to the library every Saturday morning to participate in a children’s book club. To this day Pamela remains an avid reader. Her mother taught her to sew as an alternative to store bought clothing. Pamela enjoyed designing and making most of her clothing in her late teens and early twenties. Both of Pamela’s parents taught her the value of hard work, saving money, and paying cash rather than using credit. Even more importantly, her parents instilled consistent values of respect for older adults, honesty, the value good of character and ethical behavior. Pamela’s father John, instilled a love for the great outdoors and sports. He taught Pamela practical skills like riding a bicycle, mowing the lawn, gardening, catching nightcrawlers for fishing adventures, and the thought process behind team sports and motivation. Notre Dame was his favorite football team as was Lou Holtz one of the coaches. John also loved music and had a voice that would rival Bing Crosby and the old greats. He often sang as he went about household activities. Pinochle and cribbage were common in the household and created rivalries between those who chose to play. He was a World War II veteran and a member of the Greatest Generation. He instilled these characters and beliefs in Pamela who believed that with effort, learned ability, and persistence she could achieve her goals. Pamela’s early career began as a securities clerk at the Federal Reserve Bank in Omaha which led to a position as a research secretary position at the Nebraska Psychiatric Institute and then translated into positions in advertising, sales and marketing at companies such as Warren Oil, ConAgra, Memorex, Hunt Wesson, Best Foods and Unilever. These positions and experience were valuable in the training provided and level of accountability and responsibility that later supported Pamela as a business owner. After both parents passed away, Pamela unsure of the purpose for her life, began to volunteer at Daniel Freeman Memorial Hospital in Marina del Rey, California. Through this program, she met an older woman named Billie, who helped Pamela identify her purpose in life, as a caregiver for older adults. Billie’s story is in Pamela’s book, mentioned below. While many colleagues in her corporate life cautioned her about leaving a solid career path, Pamela took the leap. There were also many others who warned Pamela that she would fail in her desire to change careers and start her own company. Pamela completed her master’s degree at Colorado State University, closed the door on her corporate career, and concentrated her efforts to research and volunteer in the aging and caregiving industries beginning in 1999. In 2000, she opened the doors of her first company, In Home and Family Services, a company providing caregiver support in the homes of older adults. This experience opened further doors when over the years, clients requested additional services not offered by In Home and Family Services. Through client requests and a recognized need for expanded services, Pamela transitioned to her next company in 2007, The Care Navigator. The Care Navigator provided services of care management, care navigation, and community transitions. Pamela personally served as court appointed guardian, medical power of attorney, financial power of attorney, personal representative of the estate and trustee. Her work at The Care Navigator opened additional doors in the areas of education, advocacy, and speaking. In April of 2009 Pamela was approached by a local radio station representative from 630 KHOW in Denver, Colorado seeking a local expert to provide education to the community about caregiving issues. The station, experiencing caregiving issues with their employees, believed in the value of a program to educate caregivers. Early in her career, Pamela worked at KETV television in Omaha, Nebraska and she was familiar with media. During her corporate career in brand management she worked with publicity firms, advertising agencies, and was interviewed on radio and television. After brief discussions and agreement with the radio station, Pamela was on air beginning Mother’s Day 2009. The program initially called “Parenting Your Parents” was changed to The Caring Generation. Producing and hosting The Caring Generation radio program from May 2009 through December 2011 was another unexpected blessing. On the program Pamela interviewed international experts on topics from medical issues, elder abuse, Alzheimer’s disease to historical and heartwarming topics of an interview with the son of the man who invented the dialysis machine and the couple pictured in the Woodstock photo tucked in a blanket. The program featured Tales of the Caring Generation, stories and lessons written by Pamela and interviews with many older adults in the community sharing their life history. These podcasts, interviews and stories are featured today on Pamela’s website in the Caring Generation® library. The goal of The Caring Generation is to bring individuals together world-wide with an interest and a desire to broaden awareness of caregiving as an important role in life and to offer education and support for this important life journey so that no caregiver feels alone. Through 2007 to 2018, as owner of The Care Navigator, Pamela continued to tirelessly serve older adults and the disabled and to pursue additional education and certifications to support expertise in the aging industry. In addition to formal education, Pamela is a Certified Guardian and a Certified Senior Advisor. Over the years clients and colleagues began to rely on Pamela to serve many needs. Dedicated, motivated, and determined to make a difference, Pamela and the staff of The Care Navigator supported thousands of individuals and families. Through her expertise at The Care Navigator, Pamela was further drawn into the world of caregiver education, caregiver support, working with family and professional caregivers and the world of publishing. The Caring Generation radio program led to requests for a book and more education from caregivers. While operating The Care Navigator, Pamela established a separate business unit under her name with the brand, The Caring Generation. The Caring Generation became the educational and caregiver support component of Pamela’s business. Writing and caregiving education continue to be Pamela’s professional passions. After spending years writing a book, she finally became serious after the end of the radio program in 2011. It took another five years of research, study, attending conferences, networking, writing and re-writing to result in the book, The Caregiving Trap: Solutions for Life’s Unexpected Changes. More information is available on the book page. The book led to speaking and other opportunities for Pamela to educate family and professional caregivers. Pamela continued to produce articles, podcasts, and videos and eventually in 2018 ventured into the world of webinars. Demand for caregiver education and Pamela’s knowledge of the need, led her to another business transition. In mid-2018, Pamela formally transitioned from her business, The Care Navigator, to focus on the business in her own name and the website with the brand of The Caring Generation. Becoming a caregiver, losing your memory, or needing care are the three of the most unpredictable and feared phases of life. Family members are thrust into the role of caregiver through crises situations. Providers in the medical and care industries remain uneducated and insensitive to the increasing number of families navigating these challenges. • Does caring for your loved one make you feel guilty, angry, frustrated or uncertain? • Are you feeling alone, embarrassed, unable, or afraid to speak up for your own care and needs? • Are you exhausted from caregiving and feel you can’t say no? • Is the stress of your care situation affecting your home and work life or creating family conflict? You’ve probably already noticed the longer you wait to act – the worse the situation becomes. You don’t know where to turn and you’ve tried to figure this out by yourself. Pamela has helped thousands of caregiver and care recipients reduce stress and learn practical tips and tools to manage care situations. Professional caregivers are limited by specialization or industry constraints. While they want to be a resource for family members, many professional caregivers lack the broad expertise of the challenges faced by family caregivers. Through her company, Pamela, reduces the emotional stress of caregiving, offers peace of mind, and a clear path of solutions for caregivers.